Boys practice at the Bhaichung Bhutia Football School, Delhi. (CNN) — “Theatre of Dreams” reads the plaque on the classroom door of Manchester United Soccer School in Mumbai. Nutritional advice and tactics are scribbled on the whiteboard and a Wayne Rooney portrait hangs on the wall. However, the arrival of Dutch coach Robert Baan as the nation’s first technical director signals a possible revival of a country with a 1.2 billion population. Appointed in October 2011, Baan was previously the technical director in the Netherlands and caretaker coach for the Australia Under 23 team. In India, he says he had spotted about five boys aged below 10 whose skills were on par with European youngsters of that age group. It is still early days, but Baan believes with continued development of India’s grassroots, the country might be ready to participate in the 2022 World Cup. “Or more realistically, 2026 or 2030,” he adds. This grassroots project involves the All India Football Federation (AIFF) opening residential academies all over the country, free to athletes and providing education alongside football training. These are different to the academies run by overseas clubs such as English Premier League champion Manchester United, which require fees and are non-residential. 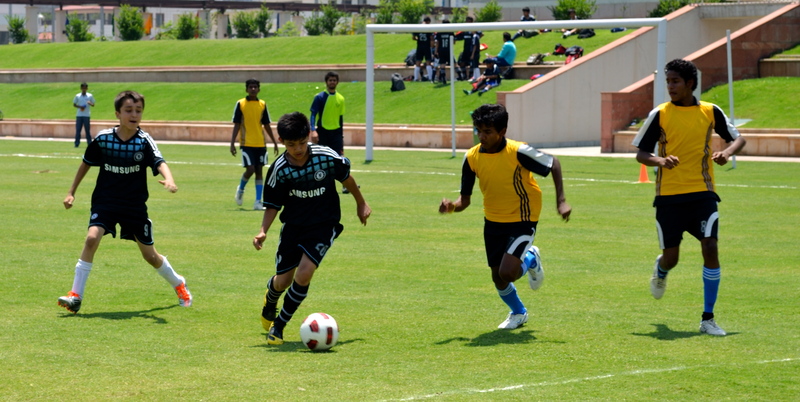 The first AIFF academy opened in Navi, Mumbai in May 2012, the second in September 2012 in Pailan, another recently in Goa, with a fourth coming soon in Bangalore. “We already have our under-19 boys in Goa and that will now be our elite academy, possibly moving to Pune in the coming months,” said Baan. Sunando Dhar, CEO of the AIFF’s domestic I-League, has high hopes for this new development. “I think this is the first positive step that Indian football and the AIFF have taken in the last 30 years,” he said. Up until the 1970s, India, which has long been one of the world’s top sides at cricket, was among the best sides in Asian football and the national team was even invited by FIFA to play in the 1950 World Cup in Brazil. In the end India failed to make it to Brazil. According to football historian and statistician Gautam Roy, the journey by ship was too expensive and the players were unable to fulfill the compulsory requirement to wear football boots, as they usually played with bare feet. The AIFF has governed football in India for 75 years and was responsible for appointing Baan. Located in Dwarka in southwest Delhi, the AIFF’s headquarters is an impressive building crowned with a huge football. That surprising admission provoked astonishment from two Indian football experts. “India has been playing football, as well as cricket, for over 100 years,” Roy told CNN. “There are so many individuals in cricket, football, athletics and hockey. Dhar defends his view and says India does not have a strong presence at the Olympics. India’s national captain Sunil Chhetri believes the AIFF’s criticism of the team dampens their confidence and argues everyone should be working together. But the main goal should be for Indians to renew national pride in their home game, which currently rejoices in its past. British soldiers introduced the sport to the country in the 19th century and an Indian team even beat them at their own game to win a domestic tournament in 1911. Roy says this victory gave India the confidence to make the move towards independence, which finally happened 36 years later. However the influence of England — or rather the English Premier League — still hangs heavy over Indian football. At Bhutia’s academy in Delhi, 14-year-old Somil, Vansh and Tannay say they stay awake until the early hours to keep up with the European Championships and the World Cup. And they all wish to go to Europe to play professionally. In December 2010, AIFF signed a 15-year lucrative seven billion rupee ($1.3 million) marketing deal with India’s IMG Reliance — a world-leading sports management company — to boost the promotion of domestic football. Dhar says revamping the I-League is a priority. But that was over two years ago and experts say little improvement has been made since. The Indian Football Association (IFA), which manages football in West Bengal, organized the country’s first international friendly between the hugely popular Venezuela and Argentina in 2011. Crowds packed out the 120,000-capacity Salt Lake Stadium in Kolkata for a glimpse of Argentina’s superstar Lionel Messi. But while tickets were in short supply to watch arguably the world’s best player, local matches remain abandoned on unpopular television channels and without effective promotion. Last year, private company Celebrity Management Group organized a Premier League Soccer, spending almost $7 million bidding for retired World Cup players, including former France international Robert Pires. However, the stadiums were not ready in time, which led to an indefinite postponement and players left in limbo without their wages. Again, these efforts, independent of the AIFF, did not make noticeable improvements to the home game. Kolkata-based Mohun Bagan A.C. and East Bengal F.C. are the biggest Indian clubs with a historical 86-year long rivalry, comparable to the Scottish clubs Celtics and Rangers. In fact, a derby match can attract a crowd of 100,000 people. “These clubs don’t know how lucky they are because they did absolutely nothing to get this kind of commitment from fans,” says Hindustan Times sports journalist Dhiman Sarkar. 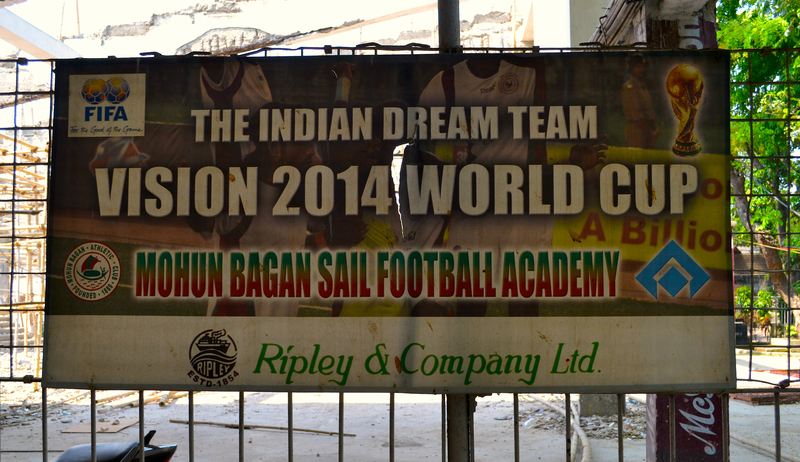 Anjan Mitra, general secretary of Mohun Bagan A.C., boasts about the club’s “worldwide” following. But when asked about the lack of merchandise available for fans, he says they have run out and will re-order soon. Bhutia now co-owns the United Sikkim club, which has risen to the I-League’s top division just five years after its formation. He argues that AIFF should be working with and advising clubs on management, attracting investors and developing players. “The AIFF doesn’t help club owners who aren’t as knowledgeable as me,” he said. “Football hasn’t changed; it’s still the same from the ’60s and ’70s. It hasn’t caught up with world football and where it’s gone. Boys practice at the Steve McMahon Football Academy, Delhi. However Roy feels worldwide perceptions are changing. The scope for development is also being keenly monitored by some of Europe’s leading clubs. Former Liverpool player Steve McMahon began the Steve McMahon Football Academy in October 2011 in New Delhi. But these initiatives still have to overcome the emphasis Indians place on education, which has traditionally overshadowed sports. Shaji Prabhakaran — FIFA’s South Asia development officer — says schools in India should give sport as much importance as math and promote its health benefits. According to Baan, Indian children are increasingly able to tell their parents “what they want.” In addition, attractive salaries, and the opportunities to become a coach or a physio, are incentives for parents to allow their children to pursue football. Last year, India placed a bid to host the FIFA Under-17 World Cup tournament in 2017, and would be given automatic participation if it is successful. Das points out that this would be the first time that India would play in a World Cup. But FIFA is demanding certain guarantees from the Indian government, such as security, tax and foreign exchange inflow, and acceptance of the bid is uncertain. Ultimately, heroes are made, not born. “The Messis of the world only come through if we create the right kind of environment,” Prabhakaran argues.